What is a Garden Coach? :: Garden Guidance What is a Garden Coach? What is a consulting arborist and horticulturalist? A consultant helps you solve complex tree and plant problems, including health and risk assessments, protecting trees during construction, mitigating damage to trees, etc. My opinion is impartial and science-based. Upon request, I can put findings and recommendations in writing in an arborist report, memo, protection plan or other document that may be required by your local municipality. – I have been working with plants and trees in San Francisco and the Bay area since 1997, as a gardener, urban forester and consulting arborist. – I am an ISA Certified Arborist, ISA Qualified Tree Risk Assessor and an ASCA Registered Consulting Arborist. I studied Environmental Horticulture at City College of San Francisco and am a Qualified Bay-Friendly Landscape Professional. – I have extensive experience communicating technical information in a straightforward, easy-to-understand way either in writing or in person. – I’ll share my extensive network of local resources and trusted professionals to assist you further. – I am always learning new things and passing this knowledge onto my clients. A garden coach helps you become a better gardener, usually by coming to your garden and giving you customized advice. A good garden coach has to know a lot about plants and gardening, and also be a good communicator. What’s the difference between a garden coach and a landscaper? A landscaper typically does all the work. Garden coaching clients generally want to do all or most of the work themselves, but value some professional advice from time to time. Doing your own gardening can save you money and can be enjoyable and educational. There are also situations when hiring a contractor is preferred – I can help you decide. How can good plant advice save me money? 1. That expensive plant you bought is dying. The nursery told you it would do well in your garden, and the pricey fertilizer they sold you isn’t helping. 2. You spent a lot of money on pruning last year, but now you have some problems. One plant is already overgrown, and another is dropping branches. 3. You had a great vegetable garden back in your hometown, and you want to have one here, but the garden is just not producing like you’re used to. In many cases, a little money spent on good advice now can save a lot of money and trouble later! Prevent overgrown plants, dead plants, bad pruning, and buyer’s remorse. – Get started if you’re new to gardening or new to this area. – Debunk “garden myths!” Don’t waste time and money on products and practices that won’t work or actually hurt the environment. Avoid planting problem plants. – Learn to prune properly – I offer general pruning advice and customized pruning tutorials. – Grow edibles! Learn the right crops and timing for your area. – Prevent “sick” plants, diagnose problems, and use organic and less-toxic pest control. – Select the right plant(s) for difficult spots in the garden. – Inspect plants at the nursery before you buy. 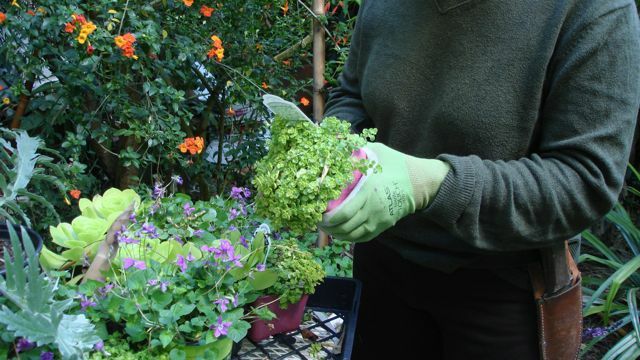 – Learn the tricks for successful specialty gardens: containers, sidewalks, indoor plants. – Renting? Create a garden while respecting the owner’s property. – Garden more environmentally: use less water, fewer chemicals and fossil fuels, attract birds, bees, and butterflies. – I offer customized workshops for individuals or groups. Ask me about free workshops for community groups and non-profit organizations.